Under the leadership of Artistic Director and Founder Lyn Williams, Gondwana Choirs delivered its most ambitious artistic program to date in 2017. Our most exciting ensembles gave concerts in in Australia and eight overseas countries that included more than 160 performances of songs by Australian composers. 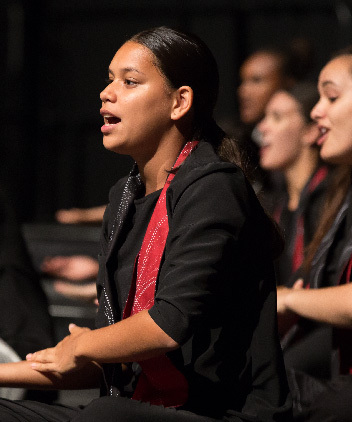 • Sydney Children’s Choir and Gondwana Indigenous Choir collaborated with the renowned Vienna Boys Choir in Songs of Country, a major cross-cultural project in Vienna, Sydney and Cairns. We were able to do this thanks to support from individuals who believe in our choirs, are thrilled by our songs and share our values of creating opportunities for extraordinary young people across Australia. I am thrilled to say that with your support we continue to do exactly that. Next year will be the 30th anniversary of the Sydney Children’s Choir and therefore Gondwana Choirs. We have fabulous plans and amazing dreams for the future and will soon be announcing a major performance celebration event. High on the wish list is a program which will see the Sydney Children’s Choir stretch its wings and embrace communities which have not traditionally been represented within the choir; a truly representative Sydney Children’s Choir . With your generous assistance we can realise our dreams and we promise to astound, uplift and inspire you.